I imagined being Laura Ingalls from The Little House on the Prairie, putting another log on the wood burning stove. It’s a clear sunny day; but make no mistake—it’-2 degrees reminding me of a time several years ago when we went up to Kettle Moraine to cross-country ski. Larry had been begging me to winter camp with him, and I wisely replied, “No”. “Look,” he said, “It will be an adventure and it’s been a mild winter. Let’s do it.” Our marriage has been about a partnership of give and take. Larry is all about his gear and likes to test the durability and reliability of his sleeping bag and tent. If the bag says, “Good to -10,” Larry wants to see if it’s true. I just like snuggling by a warm fire with a cup of hot chocolate at the end of a wintery day. We skied at Lapham near Delafield, WI with friends the first day. It’s a challenging course ending with a huge hill called Slide Run. I was delighted that all our body parts were in order at the end of the day. We spent that night with our friends in a motel across from Lapham. Then we made our way to Ottawa Lake where we set up our tent for the next night. We were the only ones in the campground while our friends smartly headed home. We skied that day at Kettle Moraine near La Grange. It was getting colder by the minute. After dinner and hot tea, we made our way to the homemade tent that Larry constructed from a 1970’s Frostline kit. Our sleeping bags were supposed to be good for below zero weather. I slid into my ice cave bag and could not get warm. I put on Larry’s very smelly and sweaty ski sweater and huddled under the sleeping bag; but the aroma of the sweater was more than I could take. I came out for a breath but the air was much too cold. I felt like a tortoise sticking my head in and out all night thinking of the song, Every breath I take—Every move I make. We finally saw the light of morning and quickly took down the tent and headed into Oconomowoc for buckets of hot coffee. It was then that we learned that the temperature that night sank to -12. “What’s this about camping on a mild winter night?” I said—- after brushing my teeth in the restaurant bathroom while trying to be incognito. We survived and winter camping is now off my bucket list. What are the lessons to learn here? Marriage is a partnership. To make it an adventure, one needs to leave the comforts of normal life. A hot shower the next day and sitting by a cozy wood burning stove never felt so good. 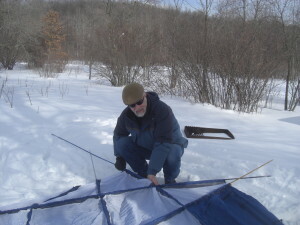 When I ask Larry to do something he is not too excited about, he remembers I winter camped with him and additionally, we now have a good www.lifewithlarry story to tell our grandkids.